So, I totally forgot about something from last week! The Saturday before transfers (the 14th of October), we did a Mini-MTC for the youth in Concordia! We ended up not getting it announced in time due to a district presidency change and a little bit of confusion about schedules, but in the end we had about 16 youth that participated throughout the day, and it was a great experience! The night before, we cleaned up the district center and organized the "MTC". The next day we started up with breakfast at 7am, and as the youth arrived we gave them a nametag, a calling packet with materials for the day, and a kit with missionary materials (a Book of Mormon, pamplets, pass a long cards, etc.). We started off with a devotional, a message from a couple from La Bianca that were the "MTC President and Wife", and then we gave a little orientation on how the day would be. They all then had a class on effective scripture study with Hno. Reyna, our branch mission leader, who served in Buenos Aires, and then we assigned everyone their companions and districts! They then went to rotation classes with three returned sister missionaries from the district, Hna. Burgui (returned two months ago from Brazil), Hna. Arriola (the daughter in law of our Relief Society President, returned 3 years ago from Argentina Posadas) and Hna. Alvarenga (returned 3 years ago from Argentina Mendoza). The classes were about the Restoration, the role of the Spirit, and the importance of the Book of Mormon. We then had lunch, prepared by some members, and then a time for them to do companionship study. After their study, Elder Streuling and I gave a workshop on the doctrine of Christ and how to focus on the missionary purpose while teaching, and then they had their district meetings with their district. We then had a workshop on finding, and we taught some basics of contacting people in the street, and then had a companionship demonstrate, and then had all the youth practice contacting the missionaries. They were nervous, but they loved it. Once we finished that, we gave an area to each companionship of youth, along with a list of former investigators, less-actives, and other people that they could visit in their area, and then they headed out for two hours to visit people and talk with them in the streets. As they all came back they were so excited! They loved it, and felt the Spirit strongly. We finished up the day with a testimony meeting, and each of the youth shared their experience that they had had as they had gone out to work in their "areas". It was nothing short of amazing. Each had felt the Spirit so strongly, and young men who were kind of on the border said that they knew for sure now that they wanted to serve a mission. Two of the young women related that they had been walking, and saw a woman get off a bus ahead of them. As they got closer, at first they didn't want to talk to her, but then they looked at each other and said, let's do it. As they got to where the woman was, they realized that she was crying. They began to share with her a message about the love of God, and the woman started to cry even more. She told them that she had just gone through some terrible things with her family, and that she didn't know what to do, and that to her these two young women were angels sent to her from God, because they arrived in just the right moment to help, just when she was feeling terrible and lost and lonely. As the young women told us about this experience, they both began to cry as well, and the Spirit was very present. At the end of the meeting, we finished with a video message that Presidente and Hna. Perez had recorded for us to show, since they couldn't be there in person. Overall, it was an awesome activity, and Elder Streuling and I loved the opportunity we had to teach other youth about missionary work, and that we were able to help plan an activity that would help them feel the Spirit in such a special way. Well, I'm almost out of time, but a quick update, our investigator Vxxx passed his baptismal interview!! He is super excited to be baptized this Saturday, and we are excited for him, too. He is an awesome kid, and it's so fun to work with him. He doesn't always understand everything, but he tries his best to learn and be better. Every time we have a lesson, he always asks us if he can do the prayer, and he practices his prayers so that he can get better every time. We also gave him his first white shirt (donated by Elder Chaname, who is pretty small-sized jaja), and Hno. Reyna gave him his first tie. Vxxx is super excited to wear his brand new shirt to his baptism. When we taught him about tithing and fast offerings, he got so excited he told us that he was going to pay tithing every week, and that he was going to fast from Monday to Thursday! Jaja we told him that it wasn't necessary, and that he would probably be pretty hungry if he didn't eat for three days, but that's just a little idea of his enthusiasm. He's a great kid. 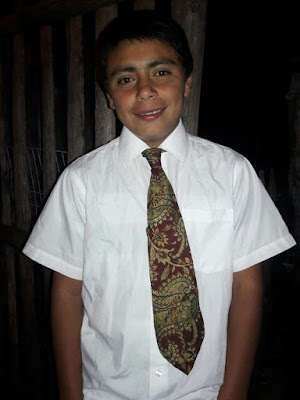 And Gabriel, our YM president, who is a convert of just 10 months and is 19, has been helping us out a ton with our lessons, and he has personally taken charge of Vxxx, to take him to activities, to accompany him to church, etc. Gabriel is awesome. I love this work, and I love the Lord! Have a great week! This is our investigator Vxxx with his new shirt and tie! Capilla Abeirta in Universidad! This is lunch. Universidad had a huge baptism after the capilla abierta of a family of 8, 5 of which were baptized (the others are little) all together! How cool is that? I played the piano for the baptism. Two new elders came to Concordia this week, one of them a brand new missionary, Elder Gallart! We shared some ice cram with them their first night to help them feel welcome. The youth returning from contacting!